Iran has entered a new and dangerous period as opposition protests escalate and the Government reacts with a fierce crackdown. No-one can say what will happen next. As Richard Silverstein says in Al Jazeera, Iran could either be at the stage of Eastern Europe just before the Berlin Wall fell or just as likely, as China was before the Tiananmen Square crackdown. Silverstein says the death this month of Ayatollah Montazeri is equivalent to the death of Chinese reformer Hu Yaobang that unleashed the Tiananmen protests. While Yaobang’s death was unsuccessful, Silverstein sees hope in Iran’s fragmented and chaotic leadership. “I doubt there is a unified Iranian command that can overwhelm the opposition in much the same way the Chinese government did after the massacre,” he said. The Iranian Government is cracking down hard on the second round of protests since the disputed 12 June re-election of President Mahmoud Ahmadinejad over Mir Hossein Mousavi. Yesterday it issued an ominous warning that “trying to overthrow the system will reach nowhere … designers of the unrest will soon pay the cost of their insolence.” They are also facing down foreign critics. Foreign minister, Manouchehr Mottaki, threatened Britain with “a slap in the mouth” for encouraging protests. Meanwhile the Iranian regime has been on the receiving end of several slaps lately. The country had been relatively peaceful for months after the traumatic events that saw hundreds killed in post-election riots. But protests have been on the rise since 87-year-old Grand Ayatollah Hussein Ali-Montazeri died. Montazeri was a former leader of the 1979 Islamic Revolution who Khomeini was grooming to replace him as Supreme Leader. He fell out of favour in 1989 after he called for a more open political system. He was demoted when Khomeini died and later held under house arrest for four years. But he remained a thorn in the side of the theocracy up to his death on 19 December. Two days later thousands attended his funeral in Qom with reports of clashes between supporters and security forces for three days afterwards. Protesters ignored the bans on further protests until the Government used the climax of Ashura, Shia’s holiest festival, to strike a decisive blow. Ashura commemorates the martyrdom of Muhammad’s grandson, Husayn ibn Ali, killed in battle by the sovereign Yazid. 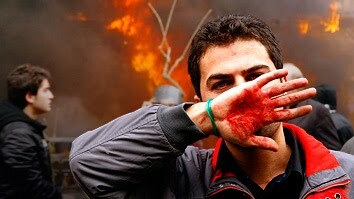 The symbolism of the day and the Iranian Government’s action has not been lost on protesters. Burnt-out cars, motorbikes and other debris littered the streets of Tehran. Hundreds were arrested and at least 15 people were killed by authorities. One of those who died on Sunday was Mir Hussein Mousavi’s 43-year-old nephew Seyed Ali Mousavi. A 4WD vehicle smashed through a crowd near his home and five occupants got out. One approached Mousavi and shot him in his chest. The men then sped away. Mousavi died before reaching hospital. Government authorities removed his body from the hospital without explanation and without a family burial. Dozens of key opposition figures were arrested during the crackdown. Among those detained were three of Mir Hussein Mousavi’s top aides, two advisers to the reformist former President Mohammad Khatami, and human rights campaigner Emadeddin Baghi. Also arrested was Opposition leader Ebrahim Yazdi. Yazdi was secretary general of the outlawed but tolerated Iran Freedom Movement and was foreign minister at the start of the Islamic revolution. A neighbour told his American-based son Youseph Yazdi he was arrested at home at 3am Monday. Also arrested was Nooshin Ebadi the sister of Nobel Peace laureate Shirin Ebadi. Ebadi said her sister, a professor of medicine, had not been involved in any social, human rights and political activities. Ahmadinejad theatrically blamed the US and Israel for the troubles his own election created. “Americans and Zionists are the sole audience of a play they have commissioned and sold out,” he said. “A nauseating play is performed.” Iranian authorities have urged its own supporters to take to the streets in a show of force against the opposition it called “pawns of the enemies.” It has called for a counter-demonstration “against those who have not respected the values of Ashura”. Writing in The Drum, Iranian expatriate journalist Arash Falasiri says the major difference between earlier protests and the current ones is the focus of anger has shifted from Ahmadinejad to the country’s Supreme Leader Ayatollah Ali Khamenei. He says while the main slogan in the first two weeks after the election was “Where is my vote”, it has now been changed to “Death to Khamenei”. But Khamenei could yet unleash death of his own before he is forced to stand aside. Iran successfully tested a medium-range missile earlier this month. Israel has announced it believes Iran will have nuclear capability by early 2010. Dangerous times lie ahead before the world can tell if it has another Berlin Wall on its hands or just blood. The end of the year brings to a close an extraordinary decade for social media on the Internet. Google has turned itself into a verb, Youtube has become a video-sharing phenomenon, Facebook has transformed the way people talk to friends while Twitter is the premier destination for finding out what is happening in the world right now. All are crucial in democratising the Internet. Yet none of them have had the same effect on democracy itself as much as technology that predated the decade. That technology is blogging, which seems almost old hat as the Noughties draw to a close. Blogs are interactive, contain posts of varying lengths in reverse chronological order, usually contain hyperlinks, allow comments, and have a blogroll of other blogs. But there is no single accepted definition of a blog. The academic Scott Wright said “It is generally accepted that a blog is a regularly updated website with information presented in reverse chronological order. But what do we understand by the term regular? I have recently updated a blog having failed to do so for several months. In the intervening period, was it a blog, a defunct blog, or a website?” Others have argued a blog must contain a blog-roll or links section, yet several highly active blogs do not have blog-rolls. The technology advances of the later 1990s made mass communications possible in a way impossible in previous eras. In December 1997 Jorn Barger coined the term weblog on his site robotwisdom.com to define his site which he saw as both a log of, and on, the web. Barger’s site contained posts and hyperlinks but had no comments or other interaction. In early 1999 Internet analyst Peter Merholz announced he was pronouncing the word “we-blog” or “blog” for short liking the new name’s crudeness and dissonance. “I like that it [blog] is roughly onomatopoeic of vomiting. These sites (mine included!) tend to be a kind of information upchucking”. Information upchucking became easier with new blogging tools such as Google Blogger, WordPress and Movable Type in the early 2000s. No longer, as A.J. Liebling suggested, did the freedom of the press belong exclusively to those who own one. Blogs evolved from listings of websites people liked to becoming personal journals sharing thoughts and conversations. Blogs have changed our politics and our world. Their hyperlinking structure created nonlinear activity and an almost instantaneous feedback loop. Hotlinks are the key to the success of the blogs. 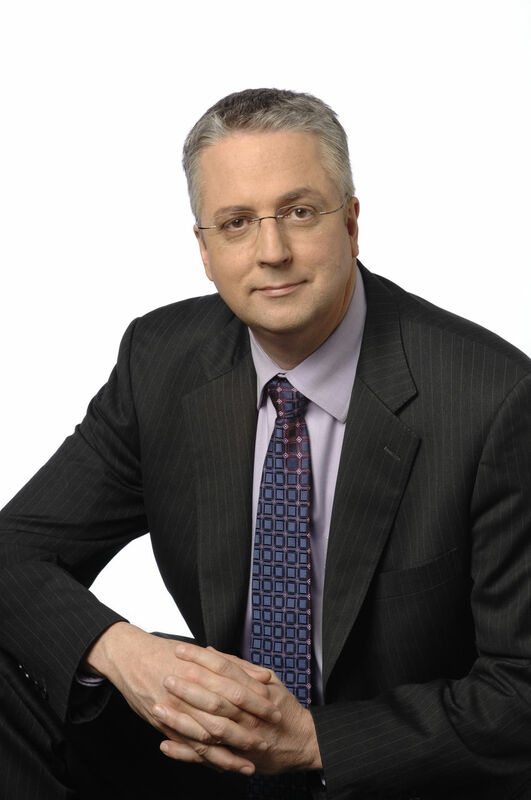 Stephen Coleman called blogs the listening posts of modern democracy. According to David Perlmutter, blogging allowed people to bypass big media and create mass communications messages without formal training, reaching large audiences, inviting others to co-author knowledge and affecting public opinion, political affairs and government policymaking. The word blog first appeared in a mainstream publication on 11 October 1999. The New Statesman described it as a “web page, something like a public commonplace book, which is added to each day…if there is any log they resemble, it is the captain’s log on a voyage of discovery”. A couple of months later the word appeared in a newspaper in Ottawa Citizen article about pop singer Sarah McLachlan. Television took another six months to cotton on and it was a typical TV down-take. CNNdotCom’s show of 8 July 2000 introduced its nerdword of the day thus: “Today’s training in technobabble: “blog”. No it’s not the way feel in the morning after drinking too much tequila the night before. And no its not one of the creatures found in Dr Seuss’s zoo”. Blogs were escaping the zoo and entering the mainstream. They were an ideal outlet to express the trauma of 9/11. At a 2002 Harvard conference on Internet communication Professor Jay Rosen of New York University identified “a new kind of public, where every reader can be a writer and people do not so much consume the news as they ‘use’ it in active search for what’s going on sometimes in collaboration with each other, or in support of the pros.” This was the germ of Rosen’s later oft-quoted idea of the “people formerly known as the audience”. Not everyone was convinced the former audience was up to the job. Washington Post editors Len Downie and Robert Kaiser’s critique of journalism decried the degeneration of political reporting and investigative journalism and said blogs were no help. “There is little [in blogs] of what journalists would call reporting (our study this year found 5%)” they wrote. While the majority ran the gamut from purely personal journals to opinions that could not make it into big media, the five percent doing reporting started to make inroads. The power of American bloggers was shown in the Trent Lott and Dan Rather cases. Lott was a congressional ally of George W. Bush but the president had to denounce him after the blogs ran hard on his Strom Thurmond 100th birthday speech. In “Rathergate” the blogs forced CBS to apologise for the fact it could not prove its documents were authentic and Rather retired. In the UK, blogger Paul Staines (Guido Fawkes) is a one-man wrecking ball with a string of British political scalps. Salam Pax’s online diary captured the frightening reality of invasion in Baghdad during the Iraqi war and disputed official accounts of the conduct of the 2003 war. Korean OhMyNews’s motto is “every citizen is a reporter while online citizen journalism outfit Malaysiakini has evolved into Malaysia’s premier news site. In Australia there have been no blog “gotcha” moments yet but they are proving successful if imitation is the sincerest form of flattery. Mainstream media have been busy copying the blogs, while damning them – including The Australian’s 2007 castigation of “sheltered academics and failed journalists who would not get a job on a real newspaper”. By 2009 News Ltd had started The Punch, while Fairfax reheated the National Times masthead and the ABC has begun The Drum. The Drum’s editor Jonathan Green was hired from Crikey where he started up an influential network of bloggers to complement its journalism. The ease of anonymous publishing in an online environment has turned it into an easy space to diagnose stupidity. Rumours, hoaxes and cheating games risk descending the public sphere into chaos and anarchy. But as Henry Jenkins notes this is not an inevitable outcome, “As the digital revolution enters a new phase, one based on diminished expectations and dwindling corporate investment,” he says, “grassroots intermediaries may have a moment to redefine the public perception of new media and to expand their influence”. That moment has arrived. Five years have passed since the Indian Ocean tsunami struck on 26 December 2004. The scale of the devastation was immense and it occurred on a hemispherical scale. 230,000 lives were lost in 11 countries, five million people were affected and $5 billion damage was caused by one of the largest earthquakes ever recorded. 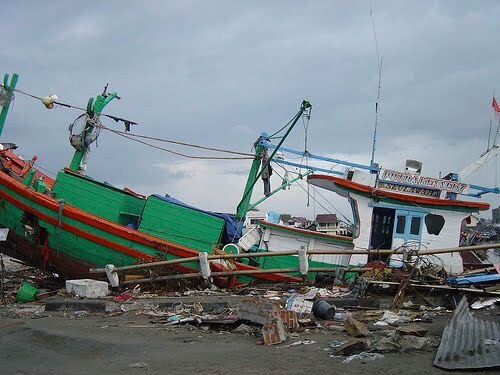 The drama started at 7am local time in Indonesia when an earthquake of between 9.1 and 9.3 magnitude struck the sea between the west coast of Sumatra and the small island of Simeule. The event lasted an unprecedented ten minutes tearing a massive rupture 1,600 kms long. It was either the second or third highest magnitude earthquake of the 20th century. The shift of mass and release of energy very slightly altered the Earth’s rotation. It caused the seabed to rise several metres displacing billions of tonnes of sea water in the process. Because of the north-south 1,600km fissure caused by the quake, the greatest waves went east and west. It took half an hour for the wall of water to reach landfall on the Sumatran Coast. In Northern Aceh waves rising 20 metres travelled almost a kilometer inland. Coastal villages were devastated losing up to 70 percent of inhabitants. 167,000 people were killed in Indonesia and another 37,000 missing. An estimated 655,000 people were made homeless. After another hour, the waves hit southern Thailand and its west coast islands sweeping locals and tourists off the beaches. 8,000 people died in Phuket, Phi Phi and elsewhere and a similar number were injured. At the same time the westerly-heading 10m high waves slammed into the east coast of Sri Lanka killing another 35,000 people and made over a million and a half homeless. A further 68 people died in Malaysia. By another half hour, it was taking severe casualties in India’s Tamil Nadu and Burma. The waves demolished railways, bridges, telecommunications facilities and harbours. The salt water contaminated large tracts of rich arable land. And still it kept coming. After another 90 minutes, the tsunami engulfed the low-lying Maldives killing 100 people and displacing another 20,000. And two and half hours later – six hours after the original quake – the mammoth waves made landfall in Somalia. 300 people died there with 50,000 made homeless and many more livelihoods lost as 2,500 boats were destroyed. Most deaths were caused by asphyxiation from the silt and sand in the “black water” of the tsunami. A massive worldwide relief operation began almost immediately. The biggest ever peacetime launch of military relief effort arrived in Aceh led by emergency teams from Australia, India, Japan and the US. Apart from immediate medical needs, the biggest threat was secondary death from famine and disease. One of the most important early tasks in Sumatra was to provide purification plants and potable water. This was difficult in a region where the Indonesian army was hauling over a thousand bodies a day from rivers. Forensic scientists were stretched to the limit to identify the deceased. The process was complicated by sweltering heat, inconsistencies in data collection procedures used in each country and jurisdictional challenges. Port, road and transport facilities also needed to be restored. Undermining the recovery effort was the influx of aid workers and media personnel who consumed scarce resources, making the cost of living soar. There were at least 500 journalists and news crews in the affected zone. The sensationalism of much of the reporting added to the trauma of the survivors. Aceh did eventually recover and the tsunami had one unintended benefit; it brought an end to the long running war between the Indonesian military and Acehnese separatists. While Australian politicians and the media continue to downplay effects of human-caused climate change, Australian scientists methodically pile up the evidence to the contrary. A new scientific paper has not only stated that the world’s coral reefs including the iconic Great Barrier Reef are in irreversible decline due to increasing carbon dioxide in the atmosphere but worse still, if these emissions are left unchecked they could cause a mass extinction event. This was the gloomy prognosis of a paper in October’s edition Marine Pollution Bulletin. The paper says today’s co2 levels of 387 parts per million is enough to cause catastrophic mass bleaching of coral reefs given a time lag of ten years. Written by ten Australian, British and Kenyan scientists, the paper entitled “The coral reef crisis: The critical importance of 350ppm” says if levels are allowed to rise to 450ppm by 2020 as the best effort proposed by the Copenhagen Accord then “reefs will be in rapid and terminal decline worldwide”. The scientists say this will be inevitable due to a synergy of mass bleaching, ocean acidification and other environmental impacts. Worse will follow should levels reach a doomsday scenario of 600 ppm (not impossible given current unchecked rates of growth). A domino effect would occur affecting marine ecosystems. The paper says anthropogenic CO2 emission could trigger “the Earth’s sixth mass extinction event”. Because reef systems have existed for 240 million years, they provide an unequalled window into the effects of climate change in geological time. Yet astonishingly scientists have found no parallel in the past with today’s conditions. “We are in unchartered waters,” say the scientists. Already 20 percent of the world’s reefs have been destroyed and another 35 percent is seriously threatened. Mass bleaching events are associated with El Nino weather patterns and normally occur every four to seven years. But now they are happening annually. Coral has a high dependence on light and temperature and slight changes in either factor can cause irreversible damage. There is no recorded mass bleaching before the 1970s. Temperature-induced mass coral bleaching was first recorded in 1978 when co2 levels were 336 ppm. Given a ten year time lag, the problem probably began around 1968 when co2 levels first exceeded 320 ppm. By 1983, co2 levels had reached 340ppm and this was enough to cause a mass bleaching of 10 percent of the Great Barrier Reef and two-thirds of all inshore reefs. 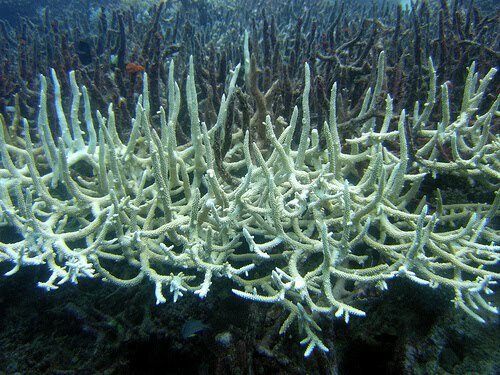 Another mass bleaching event in 1998 with CO2 levels at 365 ppm killed 16 percent of coral globally. Further events in 2002 and 2005 characterised a new phase of decline and diminishing complexity of the reefs. The paper says by the time CO2 levels reach 450 ppm coralline algae will no longer calcify which will make coral brittle and subject to collapse. Reef building processes will be severely diminished or cease entirely. Rising sea levels, an increasing number of high intensity storms, impacts from fishing and deterioration of the water quality will exacerbate the effects of mass bleaching and ocean acidification. Reefs are resilient and usually bounce back from bleaching events particularly if they are many years apart. But as they become annual events and more intense, the capacity of the corals to regrow will decline. This is not helped by human factors such as water pollution and over-fishing. This reduces genetic diversity which further hampers the corals’ ability to re-grow. The evidence suggests reefs will be the first planetary-scale ecosystem to collapse due to rapid global warming. And while bleaching is confined to the reef, the acidification will be felt more widely. It could impact molluscs, crustaceans, plankton, fish, seagrass, mangroves, marine reptiles and mammals, and estuarine habitats. I learned a new term today at work. Sue from Advertising told me I had four cleanskins to work with for next Tuesday’s paper. I looked blankly at her. Cleanskins? Was this something political or was I being offered chicken, I thought. No, Sue patiently explained, it meant I had four full pages without ads to do what I liked with. Cleanskins were an old trade term I’d simply never come across in my short experience. Yet it made perfect sense as soon as it was explained. There have been many moments like that as I deal with the new realities of life as a journalist. The biggest of these realities is the deadline. Much of my time in Roma has been spent dealing with it. It is constantly at the back of my mind. And it is adrenalin-fueling as it approaches. This feeling comes twice a week in Roma as The Western Star is issued on a Tuesday and a Friday. My Roma is the one in Western Queensland not in Italy. It was named for Lady Diamantina Roma who married George Bowen, Queensland’s first Governor-General. I wished they named the town Diamantina. Though geography doesn’t matter much on the Internet, it’s a pain sharing the name of your town with a major world capital. Though most of the conversation is in Italian, there is plenty of English conversation about the football team Roma or the Eastern European gypsies Hitler loathed as much as the Jews. 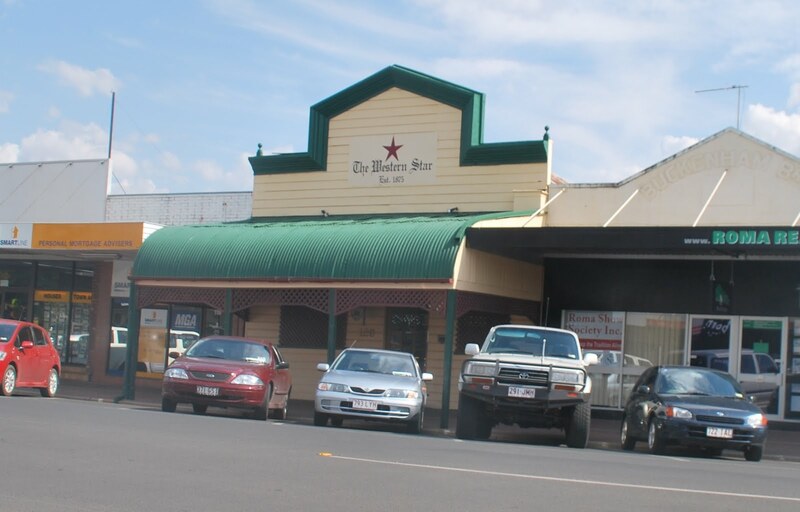 My Roma is a small town 480km west of Brisbane in the centre of a district called the Maranoa. I’ve been here three weeks and I arrived slapbang in the middle of summer heat. Already I can tell the difference between 38 degrees and 42 and am beginning to feel 30 is downright chilly. Yet I’m finding its dry heat more manageable than the suffocating sticky Brisbane equivalent in summer. Airconditing is a must. Aircon is on the faultline of my political principles. The Green in me is annoyed by its flagrant waste of resources but the leftie praises the fact that I’m made comfortable by such wonderful cheap technology. I’m now searching for a conservative side that will make serious money out of aircon made from renewable sources. In the meantime I’m earning a crust as a journalist. After four years of political blogging, I thought working for a masthead would provide me with good experience and a grounding in the daily realities of industrial journalism. I must do a disclosure at this point. Starting at the newspaper has presented me with a problem about what to say about it in a blog. I’m bound by rules I’ve happily signed up with my employer not to compete against the paper. There are also issues of confidentially and conflict of interest. I like my job here in Roma and people I work with and don’t want to say anything here that would jeopardise it. The views here are mine and not associated with APN Media. But being here has made me see clear differences between the roles of blogger and journalist. Firstly there is the power of the masthead. There are few bloggers around worldwide who have the power to ring people up and ask for quotes with a reasonable certainty they will be taken seriously. But every local masthead has this power and respect. If they are not always treated a straight answer, then at least they usually get the courtesy of a carefully constructed response which you can often query further. Also you are much more likely to elicit a response from a member of the general public when you identify yourself as a representative of a trusted brand. This means as a journalist you will have access to a lot of information. It is a powerful tool that needs careful management to avoid being abused. For all its faults, I’m finding that regional newspaper journalism is still trusted and unlikely to go extinct anytime soon. People engage with local papers because they still fulfill a strong social function. They also hold up a sizable mirror to local events unmatched by any other media. Radio has the immediacy and bonhomie of local characters, but there is little local journalism. TV is even more openly piped in from remote places. The Internet is either underdeveloped or untrusted or both. In towns like Roma, that leaves papers with a duty to provide citizens with information they need to make sense of a plethora of local events. It is a clearing house of gossip, a font of news, a big notice board for the community and a window on events in the world. But it is also a commercial entity and I’ve come to see newspaper ads as my friends. Apart from paying my wages, they also fill crucial space that suddenly makes filling a 24 page newspaper less daunting and leaves me with less cleanskins to worry about. That’s another difference between blogging and journalism. As a journalist I see 40 x 30 centimetre blank sheets of paper that have to be filled regularly where as the only pressure I had on me as a blogger was a self-imposed rule to blog daily or as near to daily as I could. Space is not an issue on the Internet, but lacking this design constraint doesn’t necessarily make it better. The tyranny of the blank page sets the creative rules of journalism. An Internet post can be one line long or a thousand but the newspaper is more or less the same size every time. The pressure to find stories is relentless and they exist wherever you find them. That means using phone calls, tips, emails, press releases, old issues, wider issues, softer issues. Papers abhor an information vacuum. The white space must be filled. If there is no ad on the space, then there simply has to be editorial content. This is where photos come in. Picture not only tell a thousand words they can fill the space of a thousand words on the page. And people like seeing pictures of themselves and people they know in the paper. Being a rural paper, I have to take most of my photos myself. I never ever envisaged myself as a photographer though Fernando Mereilles’ City of God is one of my favourite films. On most engagements I usually first have to get over my terror of my poor photographic technique and the possibility I’ll ruin the photo. I’m slowly trying to act as a photographer, and make more demands of subjects. I’m also taking more photos in the hope that some will come out. There may even be some good ones in there, or least presentable after being tightened up with a crop. Photography is therapeutic and redefining my idea of being resourceful but at this stage, I still prefer the written form to photojournalism. It is invigorating to grapple with an issue I don’t understand and attempt to unravel it and re-present that for a wider audience. In this, the blog has been very useful training in research and of threading an argument together in competent layman’s terms. But a major difference of style is the direct quote which is almost compulsory in industrial media but rare in blogs. Having one source is immeasurably better than none because it enlivens the piece and adds variety with an additional point of view. Stricter authorities such as the ABC demand there be at least two sources and I’ve seen arguments three should be the minimum. But getting so many people to talk on the record is not always easy, not even for a masthead. People are cagey or a response needs to be vetted by a media unit. And in a busy world, people are rarely on tap for a ready quote. As the deadline moves ever closer, experts quickly deteriorate from being people who have expertise in their chosen topic to being the person who actually returns your call. The telephone is my friend. I didn’t use the telephone much as a blogger, I use it a lot as a journalist. It helps I don’t have to pay the bills for the call. I always feel a slight sense of nervous energy every time I dial a number. People don’t hide as much on the phone as they do in email. The only thing better is real life meeting. I’m doing that a lot in Roma and enjoying it too. And I know that if I’m really serious about tackling those cleanskins, I’m going to have to wear out a lot of shoe-leather. The New Democratic Macau Association has marked the 10th anniversary of the handover of the former Portuguese colony with a demonstration calling for more democracy. The pro-democracy political party uses the December 20 anniversary to demand universal suffrage and a larger fight against corruption. This year’s event was especially significant. The Chinese Community Party leadership was in town for the tenth anniversary celebrations and to mark the leadership of a new government. Like Hong Kong, Macau is a Special Administrative Region with a separate constitution guaranteeing freedoms not available in the rest of China. Fernando Chui Sai On was sworn in as the territory’s new chief executive for a five year term. He is only the second person to assume the role since 1999. He replaces Edmund Ho who has dominated Macau since handover. The 52-year-old Chui has been handpicked by Beijing like Ho before him. Macau has always been considered the more compliant of the two SARs. Chui vowed to continue the “great cause” of one country, two systems but also pledged to support Chinese interests. “For years the motherland has always been a strong backing to the maintenance of Macao’s prosperity and stability,” he said. Central to those interests is protecting Macau’s gambling economy. Since 1999, Macau, which has 31 casinos, has overtaken Las Vegas and Atlantic City combined in casino revenues. It is now the world’s biggest gambling centre with an annual revenue of $12 billion. International gambling companies like Las Vegas Sands Corp. and Wynn Resorts have invested billions in the local industry. 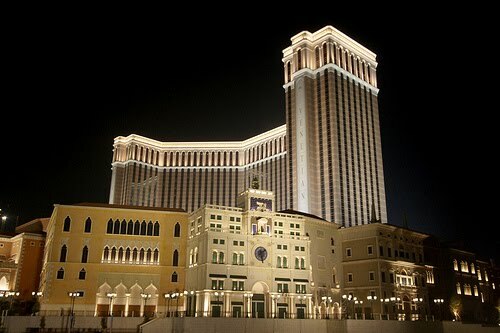 When it opened in August 2007 the $2.4 billion Venetian Macao Resort became the world’s largest casino with 3,000 hotel suites, a 15,000 sports arena, a 6,000 banquet hall and floor space for gambling games more than three times as large as any in Las Vegas. But there are dangers in relying on a gambling economy and there is also the stench of corruption. But if they were aware of it, they showed they had not learned its lesson. In early 2008, a judge sentenced Ao Man-long, Macau’s former secretary for transportation and public works, to 27 years of prison for bribe-taking related to kickbacks on construction contracts. Long had been part of Macau’s administration since 1999 but he was charged in 2007 with 117 crimes including 43 crimes of abuse of power; 41 crimes of corruption for unlawful fact; 30 crimes of money laundering; 1 crime of economic participation in business transactions; one crime of intentional wrong declaration of assets; and one crime of illicit enrichment. The stench of corruption got near enough to Edmund Ho for Beijing to abandon support. But they are unlikely to listen to protesters who want the government to combat corruption and stop selling land cheaply to the casino operators and developers. China is determined to make a success of Macau and can dictate terms with 90,000 PLA troops in the tiny garrison. It is also shrinking the physical distance between the one country and two systems by building a new $10.7 billion 50km-long bridge to link Guangdong Province to Hong Kong and Macao. It will cut driving time from Macau to Hong Kong from 3 hours to 30 minutes.